Every February, the Board of Directors begins their Board Meeting with a special ceremony to recognize the winners of the annual Norman J. Priest Endowed Scholarship. This award is given to Foundation full-time student employees who embody the ideals of former Foundation Board member Norman J. 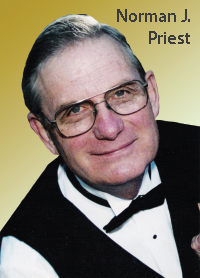 Priest through their community service, leadership skills, and involvement in the Foundation. Submitted applications are reviewed by Mrs. Halo Priest, her son James Priest, and a Foundation Scholarship Committee. Selection is based on one's resume, a recommendation from both a supervisor and a Foundation staff member, plus an essay on how the Cal Poly Pomona Foundation has helped them with their educational goals and how the award will help them achieve their career/educational goals. The essay should also highlight how participation and leadership in campus activities and community service will help them achieve their goals. Numerous deserving students have benefited from this award since 2000. As a special benefit for Foundation student employees, we are pleased to announce that we will be offering two $1,000 scholarships to Foundation student employees. Applications are now available online. Purpose: To recognize one or more continuing full-time students (sophomore, junior, senior or grad student) working for Cal Poly Pomona Foundation, Inc., and to recognize participation and leadership in campus activities, community service, and Foundation work activities. Continuing full-time student (minimum 12 units per quarter for the academic year). Completed over 30 units in undergraduate course work to qualify for sophomore status. 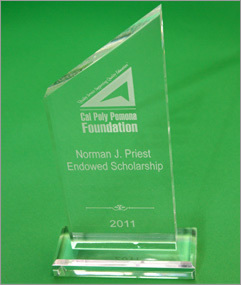 Continuing student assistant employee of the Cal Poly Pomona Foundation, Inc.
(minimum of 6 months of employment). You must work in one of the Foundation's operations. Cal Poly Pomona GPA of 2.0 or above. A committee including Mrs. Norman Priest and Mr. James Priest will review all applications and select two winners. Scholarships will be awarded by the middle of December 2018. Winners will attend the Foundation Board of Directors meeting in February 2019 for a recognition presentation. Thursday, November 15, 2018 by 3 pm--no exceptions.